"100 years" of memories and 100 years of life�You are very special and surely honor is due for all the great experiences that life has given you. You�ve done more in a lifetime than others can only dream, and you are the most amazing 100 year old that most have ever known or seen! Happy birthday on 16 October 2014"
Mangalore: On any given day, Charles Reuben Robert Michael D'Souza is like any other retired senior Citizens- He visits with friends, tends to his yard, spends some playful time with his two ducks and dog "Jimmy", plays with his great grand-daughter when she visits his house with her mom from Manipal, still drives his friend's car to do his personal errands and is in bed by 9 p.m. or 10pm after watching TV for a brief time. But on Thursday, 16 October, Michael's story will go from ordinary to exceptional, as he celebrates his 100th birthday with his family, relatives, friends, well-wishers during a celebration party that has been hosted by his two intimate pals Prof. Narendra Nayak - a Social activist and Seetharam- Owner J V and Sons (who both have been friends of Michael for decades) at Canara College Auditorium-Jail road here at 5 pm. Everyone is welcome to join in the celebration and cheer Michael as he celebrates 100 glorious years of his life and becomes a Centenarian. Prof. Nayak said, " I have known D'Souza for decades and other day when I casually asked him how old he was, he said he was 99 and I thought he was bluffing. Looking at him no one will say that he will 100 years old in few days.He then showed me his Karnataka state driver's Licence for age proof. Everyone in and around his house knows him and to honour him on this special day, we friends and neighbours decided to honour him on his forthcoming 100th birthday.When I told him that we all have joined to celebrate his birthday, he readily agreed and was overjoyed". �I�m totally fit all the way blood wise and somehow I must�ve gotten an extra gene. My wife passed away two years ago and we were married for over 78 years � that�s about as long as most people live these days" he said jokingly. �My doctor says I�ll live as long as I want to live. I have no health problems beyond the usual, and once in a while I do check up on my eyes, heart and lungs, but have found no problems whatsoever. I try to keep myself healthy and happy, without worrying about anything" said Michael boasting about his 100 years life on this planet. Michael still lives independently (having lost his wife in 2012, and has no children), wakes up by 4.30 or 5pm and cooks breakfast, prepares his own lunch and does most of the upkeep on his house himself, spends time in his garden watering the plants and enjoying the nature, and he always ready to have friends at his house to share some news and views, at his small tile-roof house on Microwave Station Road-hat Hill here. When asked how come he wakes up so early in the morning, he said it has been the habit since it was the wake-up time while he was in the British Army. He said that he is good in cooking Mangalorean style pork bafat/sorpothel and chicken items, and he has invited me for lunch or dinner one of these days- I can't wait to savour his cuisine meticulously prepared with his very own hands. He currently holds a Karnataka State driver�s license issued in the year 1959, and expires in the year 2019. Michael has been driving for the last 82 years, ever since he joined the British Army when he was just 18- and has been a safe driver since then without any traffic violations/tickets. He says even today the local police officers/cops respect him with dignity and salute him while he drives by them. He has driven in most of the parts in India, probably quite a million miles. Presently he does not drive long distance due to his age, but one could see him most of the time in city roads in his friends Suzuki Alto doing errands for friends and himself. 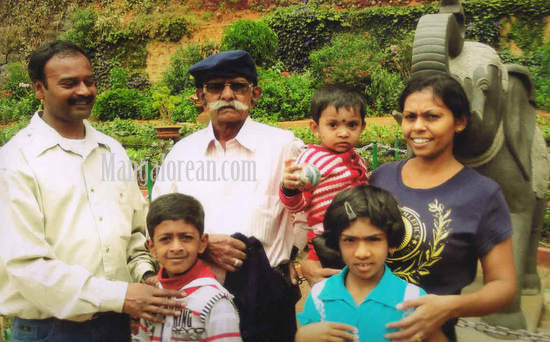 Born to Charlie Sam ( a Greek origin) and Mary on 16 October 1914 in Ooty- he was the tenth child among 13 children in the family. 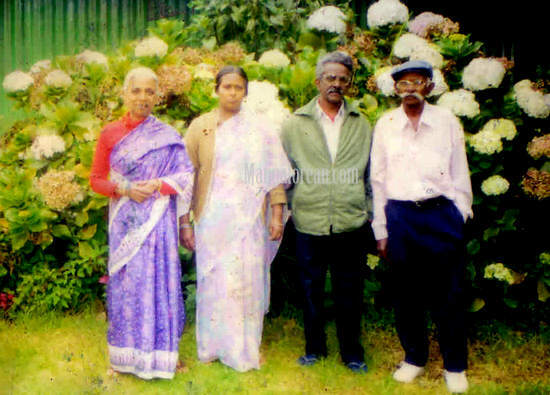 Out of the 13 children, only him and his brother Benjamin (Ooty) are alive, while his mother passed away at the age of 108. He had his schooling only up to the 10 th Std, and then he had to join the British Army when they ruled India then." It was a British rule then, if there were more young men in a family, one had to join the army. And since I was hefty and well-built then, I was forcibly picked to join the army" said Michael. Although he worked for 10 years in the army as a agreement, he was lucky that he didn't had to fight in any wars. Leaving the army job in 1942, he joined as a jeep driver for PWD in Mysore district. He was also a vehicle driver for Gas and Construction company-Achutnagar, and also jeep driver of Sandhya Farms in Bangalore.Then he served as a driver for two PWD contractors in Kinnigoli and Mangalore, until he retired for good few years ago. Although he is retired, he still does honorary job by driving his friend's car and doing their errands. Q: What is your secret behind staying healthy and being a Centenarian? I stay away from worries, I always try to be happy. Worries put you in depression, makes your health and life worse. I eat simple food, no junk or oily food. I have a very strict diet and I maintain it regularly. I have quit drinking and smoking nearly 30 years ago- that too is plus point for staying alive till this age. I don't believe in regular medical check ups, where the hospital folks make your life more miserable by letting you know that you have this disease and that disease. My mother lived up to 108 years without any health check-ups. She was healthy without any health symptoms- I think I have her gene.I want to beat my Mother's age when she died. I also do regular walk in the mornings with my dog, and little exercise. Q: How do you spend your retired time being alone? I try to keep myself occupied all the time, doing errands for friends or helping them in their work, if they need me. At home, I spend watching some TV, play with my two ducks and my dog. I also walk in my garden and enjoy the beauty of greenery. Friends also stop by at my house to chat and share their family news and views. Sometimes my grand-daughter and great grand daughter from Manipal spend few days with me, which keeps me happy and united with family members. Q : What do you have to say about the present motorists on the city streets? Terrible, dangerous and bad- most of them are reckless drivers, who never follow the traffic laws. Why do we have traffic rules and regulations if motorists don't follow them. The present drivers/riders don't think of their lives or of others. Look at me, I have been driving for the last 80 plus years, and without any accident or traffic violations. Also motorists should nit drink and drive- let them go home, relax and drink-so that no one's life is in danger. The present motorists don't have respect towards traffic laws nor towards traffic authorities. I have a very close relationship with the police force in town, just because I respect the laws and respect them. That's how every motorist should be. Q: At this age of 100 years, are you confident that you are a safe driver and that citizens don't have to worry about you being at the wheel? Trust me, I am very confident that as long as I can drive I will be a safe driver. Citizens don't have to worry or get scared when they see me at the steering wheel. All these years I have been a safe driver, a designated driver to my friends who always had faith in me as a driver, always followed the traffic rules and regulations, and I will continue to be the same way, till I decide that it's time to quit driving any more. Q: The city being congested and also filled with many reckless drivers during certain rush hours, do you feel nervous and uncomfortable to drive at those times? Not at all- I have driven in more congested and harsh driving conditions in many parts of the country. Mangalore is nothing compared to some of the busy streets that I have driven in mega cities during my job tenure as a driver for various organizations, and even British Army. I have patience and control on my self- if you have these two qualities you can navigate on any kind of streets, including Mangalore. Mangalore could be better, if motorist try to behave. Q: As a veteran driver with very good safety records, what would be your words of wisdom to the present young and old drivers/motorists? First of all if you follow the traffic rules and regulations, you will be safe and won't put yourself and others life in jeopardy. Please don't drink and drive- alcohol and driving don't match. When you get behind the think about your family at home, by not driving recklessly or over speeding. Remember, Speed Thrills, But also Kills!. Think that life is precious, reaching some place few minutes early by speeding and getting into a wreck is not worthy- drive at easy and safe. After a hour long interview with Charles Reuben Robert Michael D'souza, I invited him to join us for a lunch at our house, for which he readily agreed, and he had a opportunity to meet yet another Senior citizen-Joe D'Souza aged 74, who also happens to be my brother, and we all had a fun time over a sumptuous meal, where my shared some of his early vintage days, and Michael shared some of his, while I was patiently waiting for them to quit their conversations. It was indeed a pleasure to meet and have close encounters with Michael, where I learned lot of things from him- one was that simplicity, and dedication toward work will raech any one to greater heights. I on behalf of Team Mangalorean wish Michael D'Souza a Hap...hap...hap..Happy Birthday well in advance and May God bless him when he celebrates his fruitful 100 years on Earth. Wishes galore! Michael, You deserve a standing ovation, an honor, a salute. You�ve been a blessing to us all and soon we celebrate you! Congratulations are in order for you�re 100 you see, and many wishes for a birthday that took ten decades just to be! Happy 100th Birthday! You looks like a happy man at this age, somebody has to follow you as a role model.